At Uncle Bill’s Pet Center, we not only offer ChuckIt! dog toys for sale, we also employ a highly trained staff that can assist you in finding the appropriate toy for your dog. Extend fetch time to early mornings and late nights with LIGHTPLAY fetch toys. 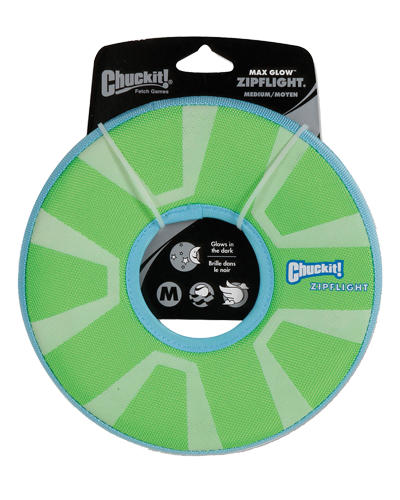 Charge under bright light 5 to 10 minutes for 20 to 30 minutes of high-visibility lighted play. MAX GLOW products are made with a safe high quality photo luminescent material that is both chemically and biologically inert. Recharge in seconds with a bright flashlight. Fast charging MAX GLOW rubber EVA foam and 2100 denier polyester construction. Glow in the dark 3D print on fabric and glow in the dark rubber ring on the bottom helps you and your dog find the flyer no matter what side it lands on. We will be glad to work with you to ensure that your pet enjoys quality toys for optimal health and happiness by providing the best selection and value on premium dog toys for sale in Indiana.